This is an article from Danetracks, published on Post Magazine on November 1, 2002. We can clearly see the Dane’s vision about “The Art of Sound Design” and see more about danetracks and its members. … Dane Davis, president of West Hollywood’s Danetracks, Inc. (www.danetracks.com), doesn’t see himself simply “painting by numbers with sound” in the “see a bird, hear a bird” tradition. Davis and his Danetracks team had a special challenge in the new Disney animated feature, Treasure Planet, which transplants the Treasure Island tale to outer space where Long John Silver is a cyborg and his pet, Morph, is a shape shifter instead of a shoulder-perching parrot. He notes that “Disney-animated soundtracks are usually somewhat simple compared to live-action features such as The Matrix. We create a level of detail that’s pretty extreme, so people were worried that our sound might overwhelm the animation.” Davis spent two years (with breaks for other commitments) as sound designer/supervising sound editor, working constantly to see how much like a live-action movie the animated feature could sound. In the end, “it surprised a lot of people” that his premise – the animation would be more real and plausible with detailed sound – worked. 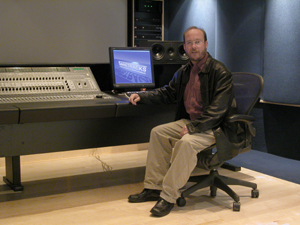 The movie’s sound effects were recorded at the Danetracks facility using Pro Tools 24-bit systems with multiple plug-ins and stand-alone digital processing programs, including U&I Software’s MetaSynth and Sound Hack. For Long John Silver’s mechanical prosthetic arm, which “can do just about anything,” Davis says he and sound designer Richard Adrian “tried a million things and picked what worked best [spinning and vibrating friction motors and mechanisms] without conflicting too much with the character dialogue.” The sounds were edited and processed to “grow the sound onto the picture” such as a sequence where the pirate’s arm whirs and spins furiously as he whips up a meal for the crew. He and the directors decided to use his own voice, sped up and pitched higher, for Morph, but he filled his mouth with Jello for gooey vocalizations with no consonants or vowels. Over time Davis developed an amazing repertoire of about 90 emotional categories for Morph with 10 to 40 variations in each.